I had some high hopes for this week. With our homeschool year getting into full swing on Monday, I kept telling myself that would mean I could finally get back into a busy, but good rhythm of doing all the things I love doing — from hiking and family time to gardening to writing & reading to knitting and spinning. And then on Monday night I had a tightness high up in my chest and this weird persistent tickle in my throat. I went to sleep early hoping to sleep it off, but by Tuesday morning I was coughing and wheezing and had to work to catch my breath when I was moving around. Ugh. I survived Tuesday and thankfully my hubby had Wednesday off of work and since I was woefully unfit to be out and about, he decided to take the kiddos to the Chicago Field Museum for a field trip and leave me with a nice long day to myself. 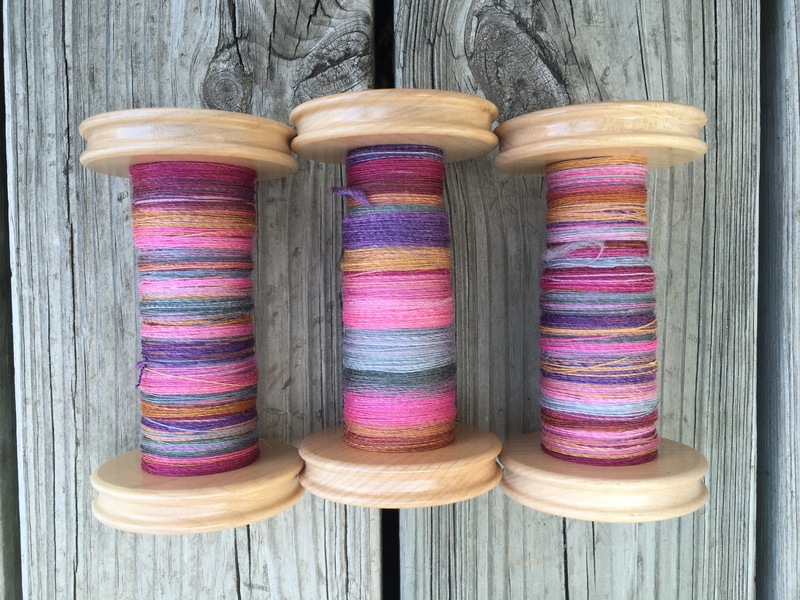 Normally I’d make big plans to get a lot done, but instead I alternated a little spinning with a lot of laying on the couch. And thus we answered an important question: How do you know when Sarah is really sick? She’s laying on the couch, not knitting or spinning. Alas, I did get some crafting done this week. 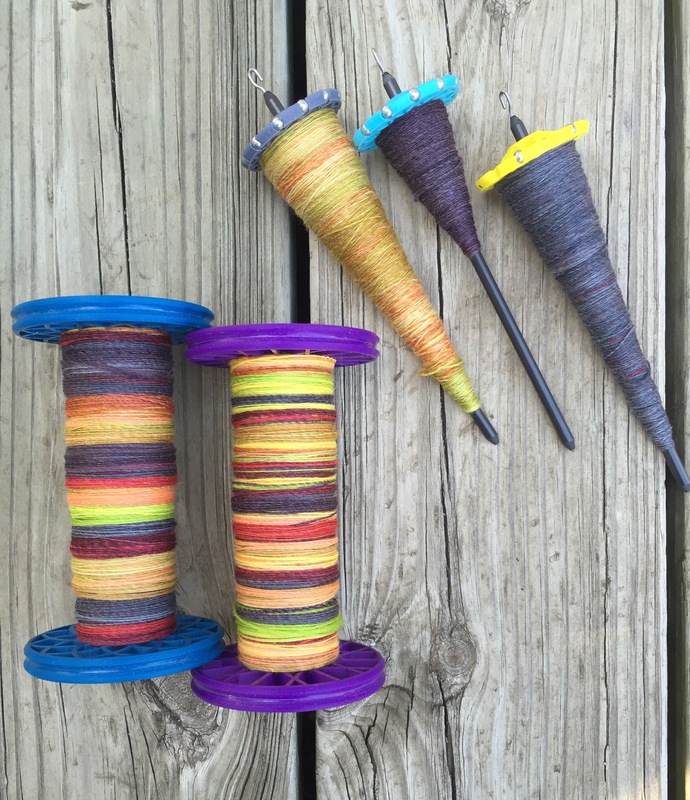 It was slow-going to be sure, but I managed to forge ahead in my efforts to FILL ALL THE BOBBINS with singles. You see, every now and then as I’m spinning along I decide to put off plying. 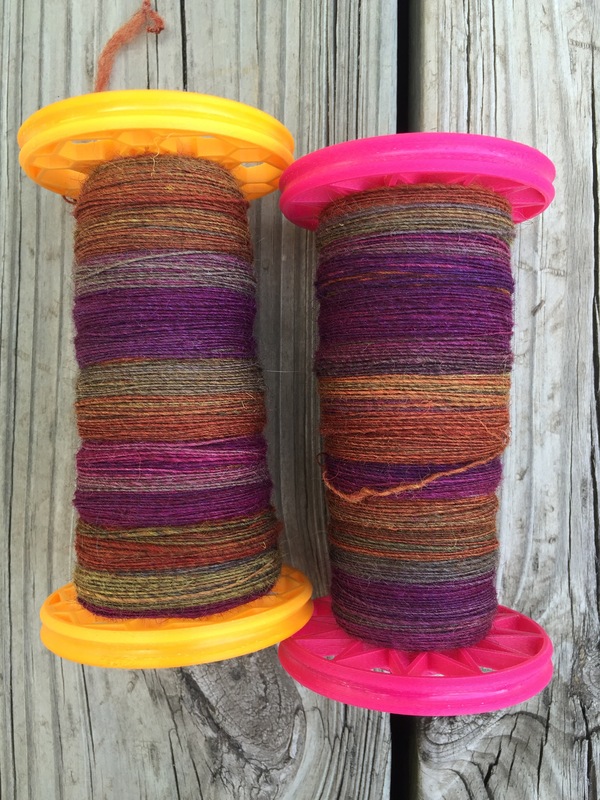 After finishing one braid of fiber, I spin another set of singles. 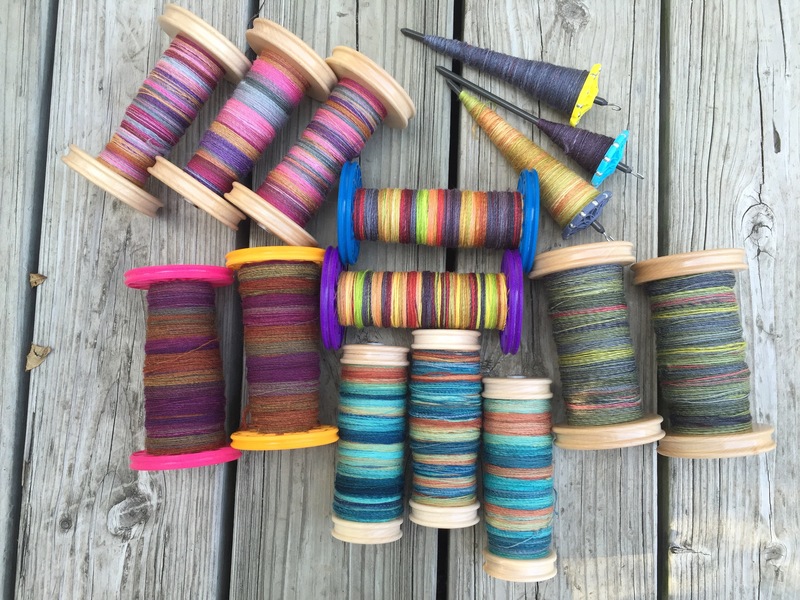 And before I know it, all I have left are my plying bobbins (and no real interest in making bulky singles) and 3 very fast bobbins and — seriously — why not just fill them up, too? I left one regular bobbin open for plying purposes, but yesterday I think I finally reached the point where I’m actually going to start plying. So what will I be plying, you might ask? My 66 Sunset from Dyeabolical. My Painter’s Backdrop from Three Waters Farm. My August Top of the Month Club, Satisfied with Summer from Three Waters Farm. Heartache from Three Waters Farm. And my first ever Nest Fiber Studio fiber, the May 2015 fiber club colorway Agaricus that I got from a destash sale. I used my Very Fast Flyer for this one (they were the only bobbins free, after all) and I posted a short video my son shot of the flyer, well, flying. A flyer moving at 36:1 is fast. As a side note, if you watch the video carefully, you can see that the rhythm of the treadling is regular, but uneven. Hilarious to me, it’s the exact same rhythm as when I cross-country ski — whoosh-whoooooosh, whoosh-whooooosh. That’s what happens when you’ve got a bum leg, apparently — you make your own weird rhythm in all things. I’m not complaining — it works! An awfully pretty picture. 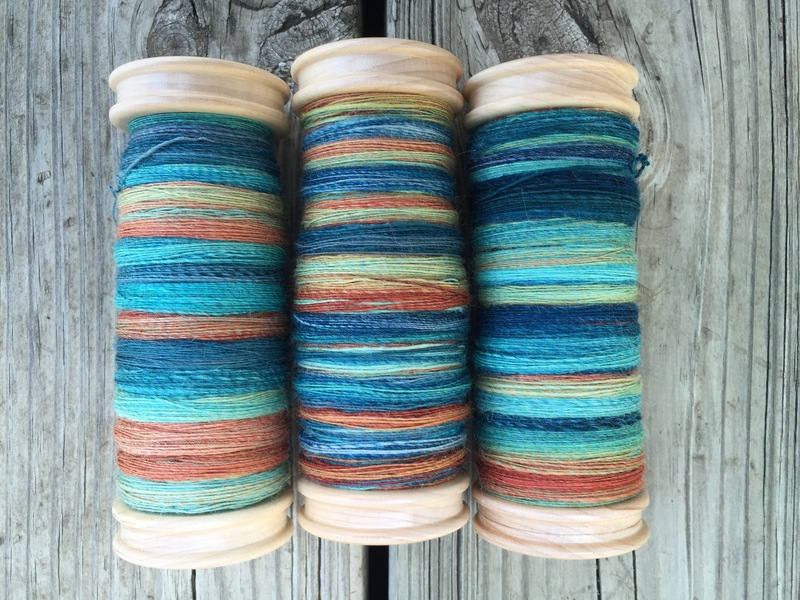 I can only hope the resulting skeins will be as lovely. As I creep all too slowly back toward feeling back to normal, the to-do list unfortunately continues to grow. My week may have been interrupted by illness, but the lawn keeps growing, the weeds need pulling, the house needs cleaning, and so on and so on. With the backlog of chores, I’m not exactly sure how long it’ll take me to work my way through this beautiful stack of singles. I sure am ready to see some finished skeins though! I had been WONDERING about that video! Thank you for explaining. I couldn’t figure out if it was wheel specific or Sarah specific. Whatever works, works! Feel better soon, I look forward to being jealous of all your new yarn in the near future. So you noticed that it was uneven?! Isn’t it too funny? I didn’t know how obvious it would be to others. Yes, though, very Sarah specific. Everything I do with my legs is like that — big hard push with my right leg, short quick with my left. This is why I can’t bike for any distance or very fast and why hiking uphill is exhausting — lol! I did notice it, and I think in part I noticed because I feel like my wheel does that on an almost imperceptible level. I often wonder if it’s my imagination or not, or a me thing, or a wheel specific thing. So when I saw yours do it at a more perceptible level, it just brought on more questions. I’ve read that we’re all slightly right or left-legged like we’re right or left-handed, so it would make sense to me that we all do it to an extent. With me, it’s just crazy-pronounced. So maybe not your imagination? Ugh! Respitory illnesses are the worst! Hope you recover quickly. Your spins are beautiful. I’m in love with the purpley ones. Yes, this one has been rough. Happy I have pretty spins to brighten my days here and there though! Look at all that loveliness! I also can’t wait to see the yarn, especially the satisfied with summer, it looks like you broke that up in interesting ways. I hope you feel all the way better soon, and I am so glad you got some couch time to rest and recover. Yes, that one will be interesting indeed! 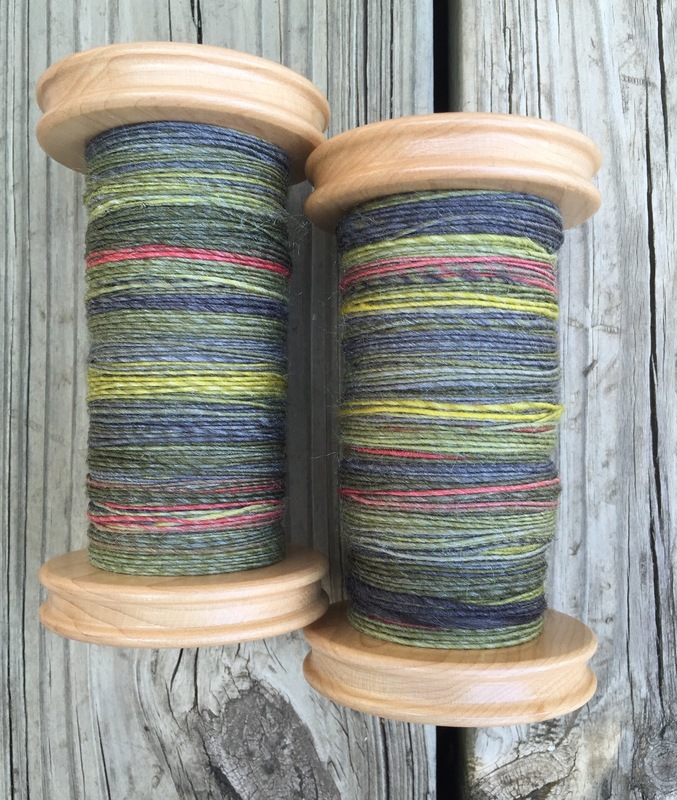 Throwing the spindles in with that and the fact that I attempted to make rolags with 1/3 of that will add intrigue. Maybe I should start there! I’m glad I had some rest, too. I honestly can’t remember the last time I spent time just laying on the couch! And, of course, can you believe shortly after I published this post my daughter was spectacularly sick. I cannot catch a break here! Thankfully, when my son was sick, my daughter was well-enough to help. And when I was at my worst, my hubby & the kiddos both helped, and now my son is ok. At least we’re all taking turns? taking turns is good – and when all are well, have a family celebration! WOW, WOW, and double WOW! Lovely outcome to downtime. Yep, you surely must have felt terrible to do no knitting! Yes! My poor Summer Sock just sat there all along. Trying to make up for lost time now! I turned my first heel today. I left off a repeat as well. I’m happy to be back at them after last week! Great idea on the toes. The pattern is beautiful, but wearing me out. I’m about 1/3 of the way through the feet, 2AAT, so getting there. I’ll see how my time works out as to how I treat the toes. For me, it was partly because of where I needed to stop for length. Then I just thought it would be fun to incorporate all three yarns in the last one. I’m about 1/3 through sock #2’s cuff. This one is going much faster as I know the pattern so much better.